Jonathan Northall's account of the 1992 World Cup is, I suppose, a little bit of a rarity in that it concentrates on one World Cup tournament only. It is naturally very welcome as it is able to cover that tournament in much more detail. The 1992 World Cup, held in Australia and New Zealand, is possibly best remembered as the occasion of Pakistan's first and so far only triumph in a final to lift the coveted cup. There was so much more besides and Jonathan's book covers all the events in great detail. It was the tournament in which South Africa made their first, belated World Cup appearance after being in the wilderness since 1970 and one in which they almost reached the final. As one might imagine, there is plenty of information within the book's 366 pages and it has been excellently researched with great attention to detail. In the appendices, there is a match scorecard with more than usual statistics as well as averages for all participating players. Whilst giving very thorough match accounts, quite a few of the players have been interviewed which naturally gives the book even more impact. 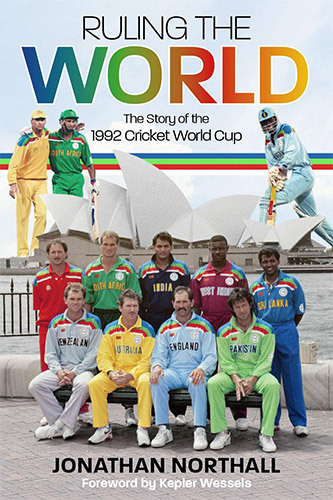 Kepler Wessels, South African captain in the 1992 tournament but also an Australian player in the 1983 World Cup, has written the foreword. There is a lot of information here which may not be readily available elsewhere including Mackay's only ODI which was rained off after just two balls and the sterling but unsuccessful attempts to keep the game going. I am sure that Ruling the World will delight many readers who prefer an in-depth account of one of the eleven World Cup tournaments.